Climate change could expand the agricultural feasibility of the global boreal region by 44 per cent by the end of the century, according to a study. However, the scientists warn that the same climate trends that would increase land suitable for crop growth in that area could significantly change the global climatic water balance – negatively impacting agriculture in the rest of the world. Scientists from the University of Leeds in the UK assessed the impact of climate change on land that could support agriculture in the boreal region, which includes large sections of Canada, Sweden, Norway, Finland, Russia and the US. Currently only 32 per cent of the boreal region falls into ‘growing degree days’ – the climate parameter linked to crop growth – and rainfall requirements for small cereal crops, such as oats and barley. Using global climate models the team was able to predict the future extent of growing degree days and changes in rainfall. Contrary to previous analyses, new research published by Michigan State University shows that projected changes in temperature and humidity will not lead to greater water use in corn. This means that while changes in temperatures and humidity trend as they have in the past 50 years, crop yields can not only survive – but thrive. Abstract: Most estimates of Chinese regional Surface Air Temperatures since the late-19th century have identified two relatively warm periods – 1920s–40s and 1990s–present. However, there is considerable debate over how the two periods compare to each other. Some argue the current warm period is much warmer than the earlier warm period. Others argue the earlier warm period was comparable to the present. In this collaborative paper, including authors from both camps, the reasons for this ongoing debate are discussed. Several different estimates of Chinese temperature trends, both new and previously published, are considered. A study of the effects of urbanization bias on Chinese temperature trends was carried out using the new updated version of the Global Historical Climatology Network (GHCN) – version 4 (currently in beta production). It is shown that there are relatively few rural stations with long records, but urbanization bias artificially makes the early warm period seem colder and the recent warm period seem warmer. However, current homogenization approaches (which attempt to reduce non-climatic biases) also tend to have similar effects, making it unclear whether reducing or increasing the relative warmth of each period is most appropriate. A sample of 17 Chinese temperature proxy series (12 regional and 5 national) is compared and contrasted specifically for the period since the 19th century. Most proxy series imply a warm early-20th century period and a warm recent period, but the relative warmth of these two periods differs between proxies. Also, with some proxies, one or other of the warm periods is absent. 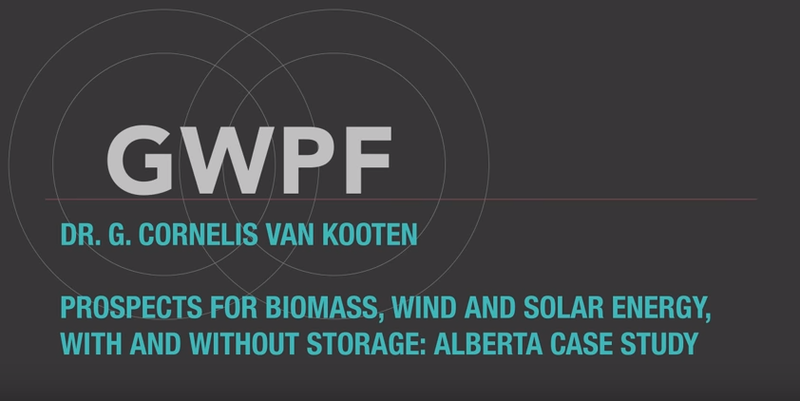 by Presentation by Dr. G. Cornelis van Kooten on the Prospects for Biomass, Wind and Solar Energy, With and Without Storage: Alberta Case Study at the GWPF on May 24, 2018. Many hundreds of thousands more bill payers face the risk of sudden energy tariff hikes because almost 40 suppliers may be forced to squeeze their customers to survive. The report, seen by The Sunday Telegraph, ranks 37 of Britain’s 81 energy suppliers as being at risk. Eight are identified as being on the brink of failing based on forensic analysis of company financial accounts and trade payments. Please could you reassure your readers,” said the charming young man from the environment department, “that we have not banned wood-burning stoves? No one will have them taken away.” His anxiety was understandable. There is a mutinous stirring in the countryside, following the strictures issued by his boss, Michael Gove. In his Clean Air Strategy, launched last week, the environment secretary indicated that various types of stove would have to be taken off the market because the amount of soot they produce sends too many of us choking into an unnecessarily early grave. It’s all very confusing. For years we have been actively encouraged by government to switch our domestic fuel supply to wood, on the grounds that it is much less damaging “to the planet” than burning fossil fuels. My family home, unconnected to the gas grid, is fuelled by oil brought in by small tankers. But we have woodland; and I have often been tempted by the leaflets that get posted to us, advertising the subsidies we could enjoy if we switched to a wood-burning stove. These are not just from companies flogging the things (“Not only do you get the benefit of installing a stunning wood pellet boiler, but you also earn money from it — up to £11,900 over the next seven years starting from the moment it is fitted”). The hard sells come from the Department for Business, Energy and Industrial Strategy, too. “Welcome to the domestic renewable heat incentive (RHI) payment calculator,” it cheerily told us a couple of years ago, with the additional happy news that there would be an increase of almost 70% in the domestic RHI biomass subsidy. The flagship of the government policy was the Drax power station in Yorkshire, which in return for switching from coal to wood is now receiving more than half a billion pounds a year in subsidy from the taxpayer. The wood pellets burnt at Drax largely come from the southeastern United States, in a vast, highly mechanised operation. Given this, not to mention the lorries carrying the wood to American ports, the ships that take the stuff across the Atlantic and the diesel-powered transport that completes the journey across the UK to Drax (at the rate of 14 trains a day), one can only goggle at the government’s previous assertion that it assumed “no net emissions [of CO2] during production”. 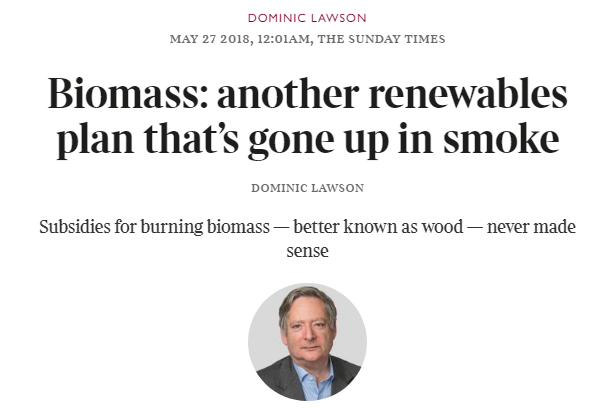 Even if that, impossibly, were the case, there’s still the little matter of the particulates (aka soot) generated by the colossal wood-burning programme. As Ridley pointed out at the time, everyone knew that ploughing more subsidies into biomass heating of domestic homes was almost certain to break the law on air quality.